Our all-time customer’s favorite! The Rigid Formed Stock Aid makes putting on your socks a lot easier without bending! The RIGID Formed Sock Aid, made of a plastic material that doesn't give, helps you pull your sock onto your foot with little effort and no bending! The braided cord line with foam hand grips make it much easier and comfortable to grasp. Great for users with limited hand strength, back problems, have trouble bending, are recovering from hip or knee surgery, or uses a wheelchair. 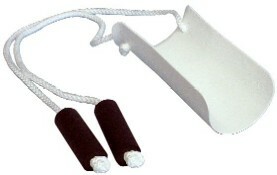 The sock aid also features a foam pad which adheres to the underside of the sock aid to prevent the sock from slipping. Made in the <?xml:namespace prefix = st1 ns = "urn:schemas-microsoft-com:office:smarttags" />USA!